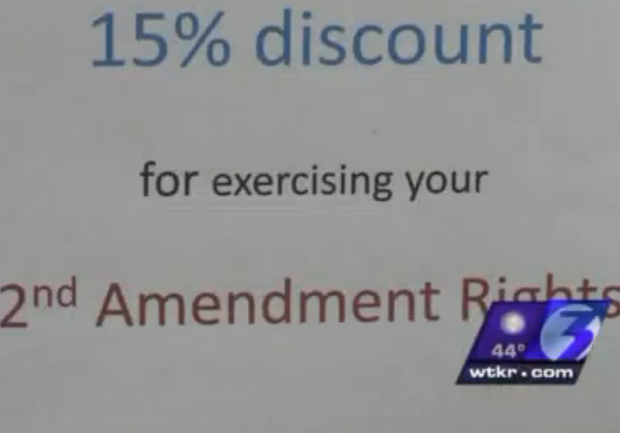 VIRGINIA BEACH, Va. A Virginia Beach pizza shop owner is showing his support for firearm rights by giving gun owners a 15 percent discount. The discount is given to anyone who brings a gun or concealed handgun permit to All Around Pizzas and Deli. Owner Jay Laze tells news media outlets that he'd planned on offering the discount for a limited time. But he says the response has been overwhelming and he might make it permanent. Since the discount began last Friday, Laze says 80 percent of his customers have brought guns into the pizza shop. He says one customer came in with an AK-47. Laze is a gun owner and says he's always been a supporter of the right to carry firearms. Laze started the offer after a Utah frozen yogurt shop made headlines earlier this month for also giving gun toters discounts, CBS affiliate WTKR reports. Laze's support for gun ownership is incorporated throughout his business, the station reports. "I actually hire delivery drivers that do carry openly," he says.